There are certain food you need to avoid because they will break your braces. It is also not uncommon for your lips, cheeks, and tongue to become irritated for one to two weeks as they toughen and become used to the braces. You may develop a canker sore which is an ulcer inside your mouth. Canker sores are not contagious, just unpleasant. They can last 1 to 2 weeks. 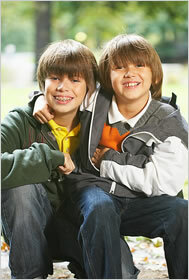 We would be happy to give you some wax that you can put over any sharp area of your braces that are causing irritation. If you need more wax, please let us know. You can also swish with warm salt water or Peroxyl 2-3 times per day and place numbing gel on the ulcer if necessary. Dr. Cohen may have placed bite ramps along with your braces to make your treatment more efficient. The bite ramps will be removed as soon as the bite has changed enough (usually 6 months). If your bite ramps are behind your two upper front teeth, their purpose is to open the deep bite, speed up tooth movement (thereby lessening your time in braces) and prevent breakage of the bottom braces. You will notice difficulty chewing in the first few days as you adjust since your back teeth are not meeting together as usual. This is normal and you will adjust to this after a few days and no longer have any eating issues. In the meantime, cut your food into smaller pieces and if necessary, stick to softer foods.